If you’re driving around tomorrow and see Darth Vader riding a glittery, hot pink Princess bicycle, give a honk and a wave. It’s my my daughter, out enjoying being four. Happy Birthday, Abby dear- your mama loves you more than she has words- and that’s saying something. Is it just me, or does your face look thinner? Love the pictures, what a darling little girl Abby is. I can’t believe that she is 4 already. It doesn’t seem like it was that long ago that I was reading your posts about you being pregnant with her. HAPPY BIRTHDYA ABBY!!! Hope that 4 is a great number for you!! 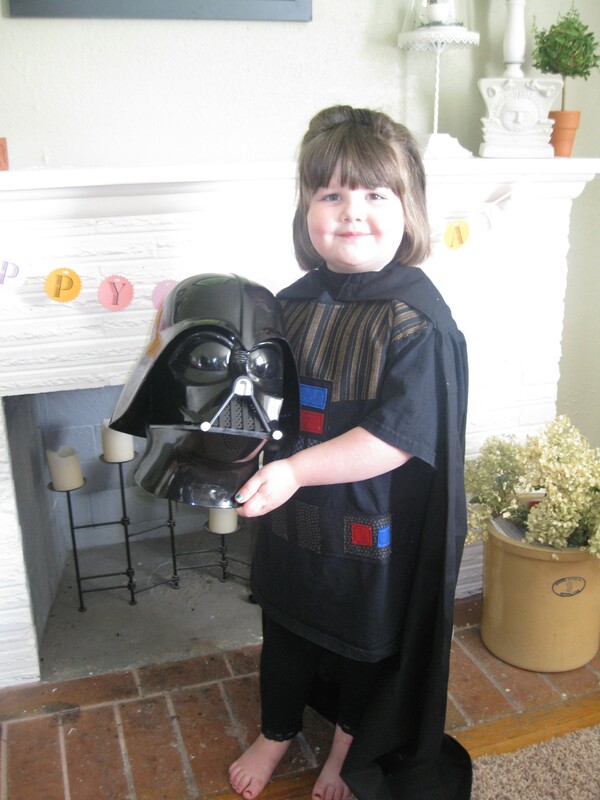 Happy birthday, cute Abby, I mean, Darth! The costume looks great, Tracy! My 4-year-old girl likes to run around dressed as Darth Vader too! Happy Birthday, Abby, and thank you for expanding my son’s mind! I have a photo of my daughter outside riding her bike in a Superman costume when she was about 6. (It was actually her brother’s old pajamas, but it had a cape and everything.) One of my favorite pictures of her.